Leader of the self-proclaimed Donetsk People's Republic Oleksandr Zakharchenko has ordered that local elections across the DPR be held on October 18, 2015 in accordance with the Minsk agreements. 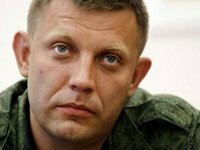 Zakharchenko's relevant statement was circulated by the Donetsk news agency on Thursday. "In today's situation, which emerged through Kyiv's fault, the Donetsk People's Republic has to independently start to implement the Minsk agreements in order to rescue them. We will begin acting immediately, without waiting for Kyiv to come to its senses and return to real, not fake, talks, because any further procrastination and delays will benefit only the Ukrainian party of war," the DPR leader said. "First, the DPR, in compliance with Points 4 and 11 of the Set of Measures, declares that in line with the republic's constitution and laws in so far as they are not at variance with them, a special self-rule regime is in force in its [DPR] territory, certain conditions of which are mentioned in Ukraine's law On Special Status of Donbas ('On special local self-rule regulations…'), in Point 11 of the Set of Measures, as well as in the draft amendments to Ukraine's Constitution proposed by us," Zakharchenko said in his statement. "Second, in compliance with Points 4 and 12 of the Minsk Set of Measures, I set local elections over the whole of the DPR for October 18 of this year. As required by Points 4 and 12 of the Set of Measures, the elections will take place 'on the basis of Ukraine's Law on temporary self-rule status of individual districts of the Donetsk and Luhansk regions' in so far as they are not at variance with the constitution and laws of the DPR," he said.